The European Parliament elected in 2004 has left its stamp on some far-reaching EU laws. The drafting of these laws is the domain of the European Commission - it is not the European Parliament's job. But MEPs have the power to shape, or to reject, a steadily increasing proportion of EU legislation, by a process known as co-decision. This means that the legislation needs the backing of both the parliament and the Council of the European Union (made up of ministers from the governments of member states) before it becomes law. Here is a selection of the directives and regulations that MEPs standing for re-election in June have voted on. Reach stands for Registration, Evaluation and Authorisation of Chemicals. The regulation took effect in June 2007, replacing 40 other pieces of legislation. About 30,000 substances will have to be registered with the new Chemical Agency in Helsinki by 2018. The new law puts the onus on the chemical industry to prove that its products, including those that have been on sale for years, are safe. Previously it was up to the national authorities to prove that a given substance was hazardous. A safety report now has to be drawn up for chemicals produced or imported in quantities of more than one tonne per year. The European Parliament substantially rewrote the Commission's original Services Directive, and the agreed version is set to take effect from the end of 2009. It is designed to create a free market in services - the fourth "basic freedom" of the EU, after free movement of persons, goods and capital. The Commission wanted service providers to have the right to operate under their home country's rules, even when working in another member state, but MEPs rejected this idea (known as the "country of origin" principle). They argued that this could undermine standards, leading to "social dumping" and a "race to the bottom". The revised text says the new directive will not affect local labour law or collective agreements in member states. The directive does not include healthcare, social services, public transport, financial services and some other areas. The EU package on climate change is set to become law in 2009 - the result of complex negotiations and intensive lobbying by industry and environmentalists. It sets the following targets, to be achieved by 2020: a 20% reduction in carbon dioxide (CO2) emissions, compared with 1990 levels; a 20% share for renewable energies in EU energy consumption; savings of 20% in energy consumption through energy efficiency. A key element in the plan for a greener future is the Emissions Trading Scheme (ETS), which will gradually be expanded. But in December 2008 EU leaders eased the conditions for industry, because firms were complaining about the extra cost of green adaptation in a recession. In 2007 the EU set a "eurotariff" price cap on mobile phone roaming charges - the cost of making and receiving phone calls while abroad. From July 2009 the maximum that home operators may charge customers will be 43 euro cents (£0.40) per minute for outgoing roaming calls and 19 euro cents for incoming calls (both excluding VAT). It is the second such EU-wide drop in the cost of voice calls. MEPs also voted in April 2009 to cut the cost of texting and using the internet on mobiles abroad. The cap for a "roaming" text will fall to 11 euro cents (10p; 14 US cents), from about 29 cents on average. These EU-wide caps, excluding VAT, will also take effect in July. This longstanding directive stipulates that no employee in the EU should have to work more than an average of 48 hours a week. It also establishes how many breaks they can have and how much holiday they are entitled to - all aimed at preventing exploitation of workers. The UK government, along with 14 other member states, negotiated an opt-out from the directive. 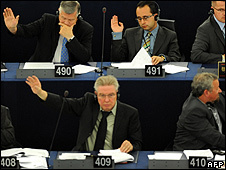 The European Parliament voted in December 2008 to cancel the opt-out, but MEPs' conciliation talks with EU ministers later failed to produce a new deal on the directive. A key sticking point was how to define on-call time - whether it should count as working time. So the current directive and opt-out remain in force. It is up to the European Commission to decide whether to draft a revised directive. Many argue that a revision is overdue, because several European Court of Justice rulings affect how the directive is implemented. The UK government, which wants to keep the opt-out, is at odds with a majority of Labour MEPs, who want to scrap it. In January 2009 the European Parliament voted in favour of proposals from the Commission to tighten rules on pesticide use and ban at least 22 chemicals deemed harmful to humans. EU governments have not yet approved the rules. The draft law would ban substances that can cause cancer or that can harm human reproduction or hormones. In addition, any use of pesticides near schools, parks or hospitals would be either banned or severely restricted. Large-scale aerial crop-spraying would also be banned. Many UK farmers and some British MEPs question the science behind the legislation and say it would unfairly hurt UK agriculture. MEPs approved legislation in 2006 to standardise food product labels to prevent misleading claims. The new rules target the use of health or nutritional claims, such as "low fat", "high fibre" and "helps lower cholesterol". The legislation bans vague claims for foods, such as "preserves youth", along with slimming or weight control claims and health claims on beverages with more than 1.2% alcohol content. In July 2008 MEPs voted to make airlines display the taxes and charges that passengers have to pay, to stop the misleading offers of bargain basement flights. Airlines are now obliged to give comprehensive information on air fares, including on the internet. Parliament widened the pricing transparency to include all flights departing from airports in the EU, regardless of destination. Rules establishing an EU-wide procedure for handling illegal immigrants were approved by MEPs in June 2008 and are expected to become law in 2010. The rules say illegal immigrants can be detained for up to 18 months and face a five-year re-entry ban. However, they will not automatically apply in Denmark, Ireland and the UK because these countries have negotiated opt-outs.